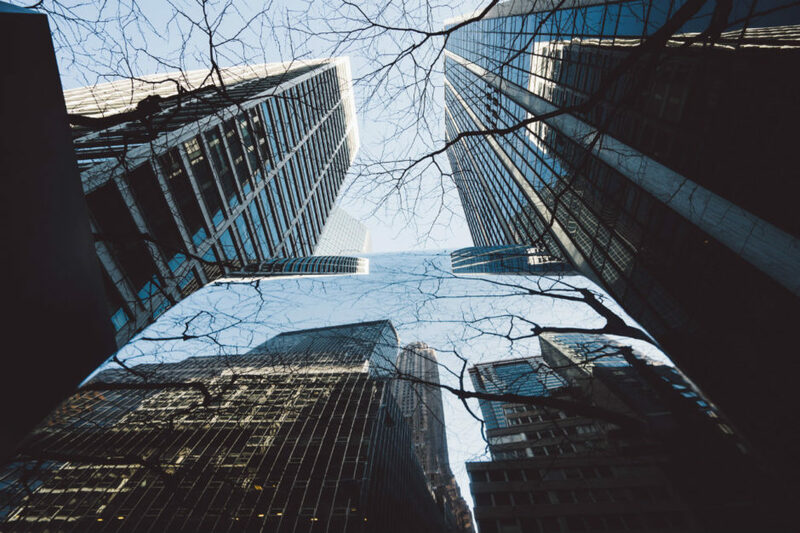 THE FINANCIAL AND CULTURAL capital of America, New York City has an energy like nowhere else. 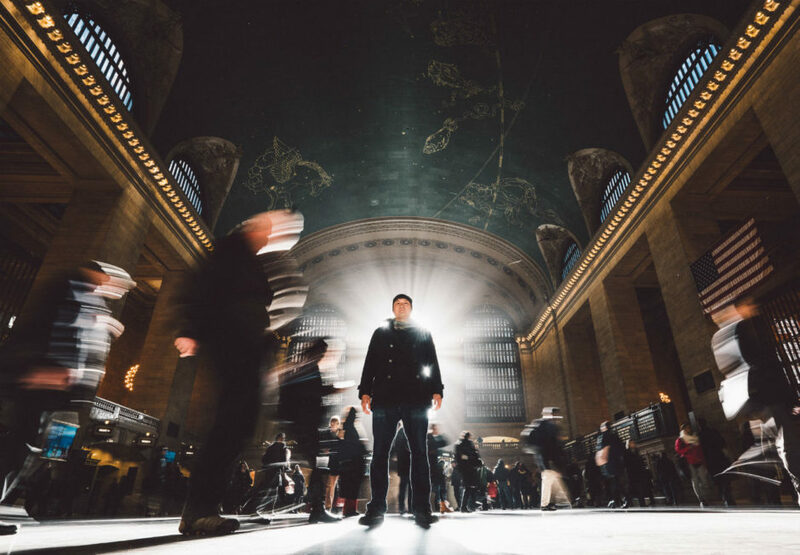 Most of the iconic spots — from MoMa to Times Square to Broadway — are in Manhattan, so you’ll likely want to make it your base from which to explore the neighboring boroughs of Brooklyn, Queens, the Bronx, and Staten Island. But this is a city where the chance to take incredible photos is waiting around every corner. With that in mind, here are 12 spots for images that’ll elevate your Instagram to the next level. Taking New York City’s only tramway costs the price of an MTA swipe and gets you clear views of the East River, Queensboro Bridge, and down the canyons of buildings that run along 1st and 2nd Aves. 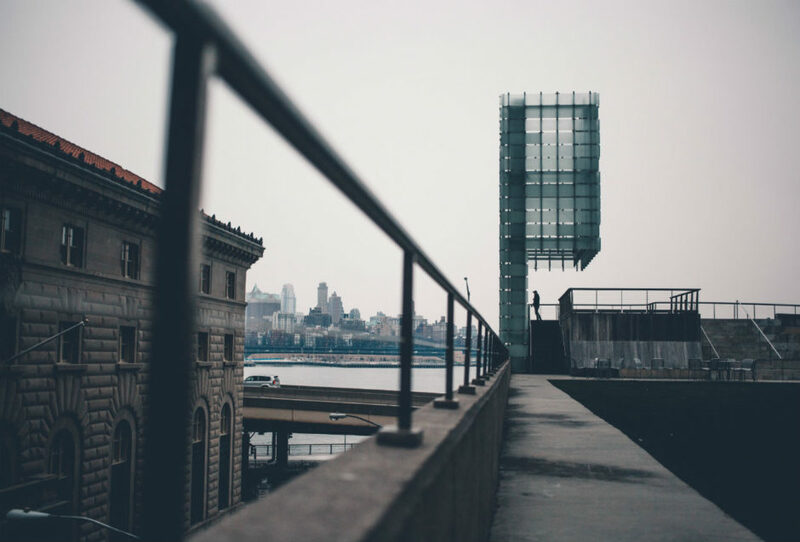 It's an underrated activity for taking photos, and, as a bonus, once you arrive at Roosevelt Island you’re greeted with more views of both Manhattan and Queens, and you can visit the equally underrated Franklin D. Roosevelt Four Freedoms Park. 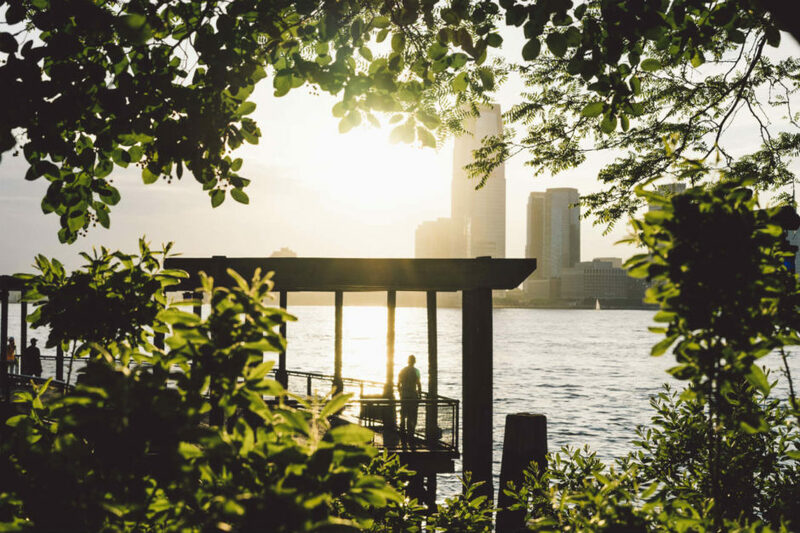 An interesting escape from the downtown streets, this hidden park, called Elevated Acre, is accessible through a few nondescript escalators at 55 Water Street in the Financial District. Once up here, you’ll have views of the adjacent buildings on one side and the Brooklyn Bridge and seaport on the other. In between, there’s a neatly trimmed grass lawn, a maze of bushes, and the glass sculpture pictured. Give the installation perspective by getting a friend to stand in the frame. 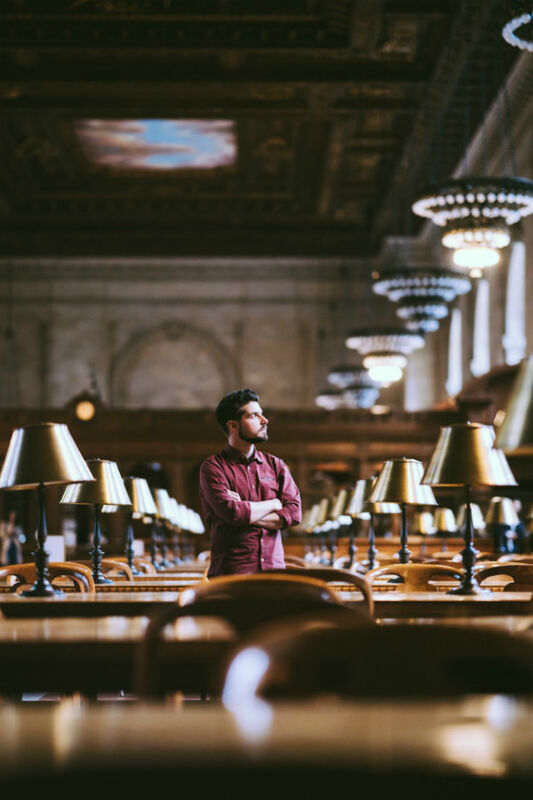 With its painted ceilings and immaculate Beaux-Arts architecture, the New York Public Library is one my favorite buildings in New York City. Arrive early to beat the crowds and stand a chance of taking an image that evokes a sense of peace. This shot was taken in the lobby, but if you decide to capture photos in the study rooms, consider using your phone’s camera rather than a DSLR; it’s less obtrusive. 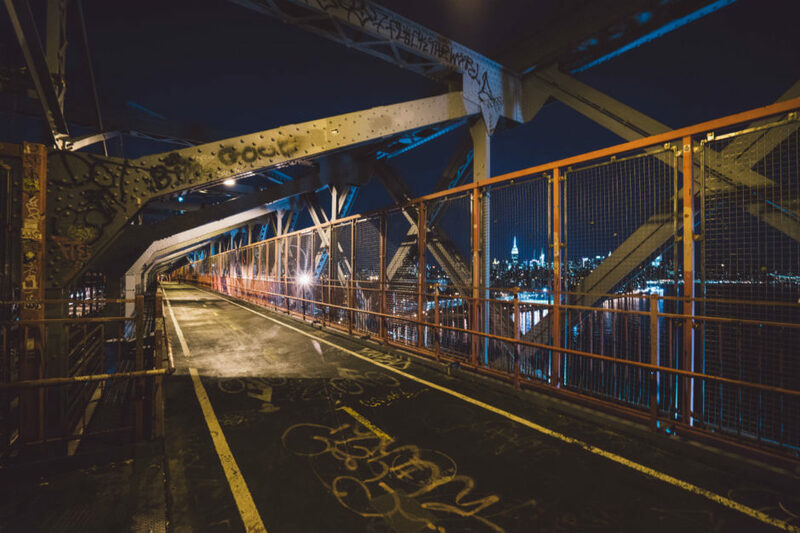 If you’re going for that “gritty New York City” feel, head to the pedestrian walkway of the Williamsburg Bridge. With its colorful beams, graffiti tags, and the constant movement of trains that run by, you’re almost guaranteed a great shot. Shoot after dusk to capture the contrast of Manhattan’s electric lights against the sky. 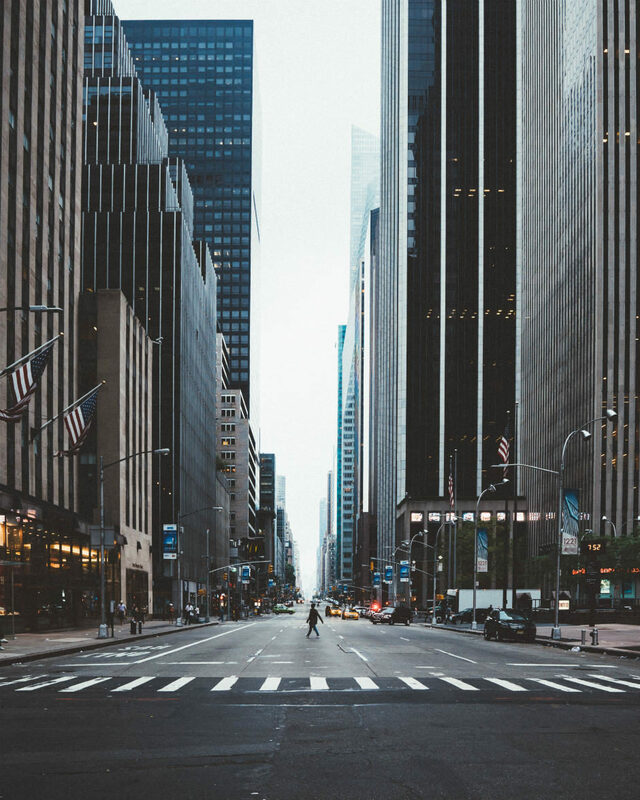 Sixth Avenue — which runs from Franklin Street in TriBeCa to Central Park — is one of the most crowded areas in NYC, but with good timing and a little luck you’ll be able to shoot one of the widest avenues in the city when it’s (nearly) empty. The best time to take this shot is at sunrise on a weekend. 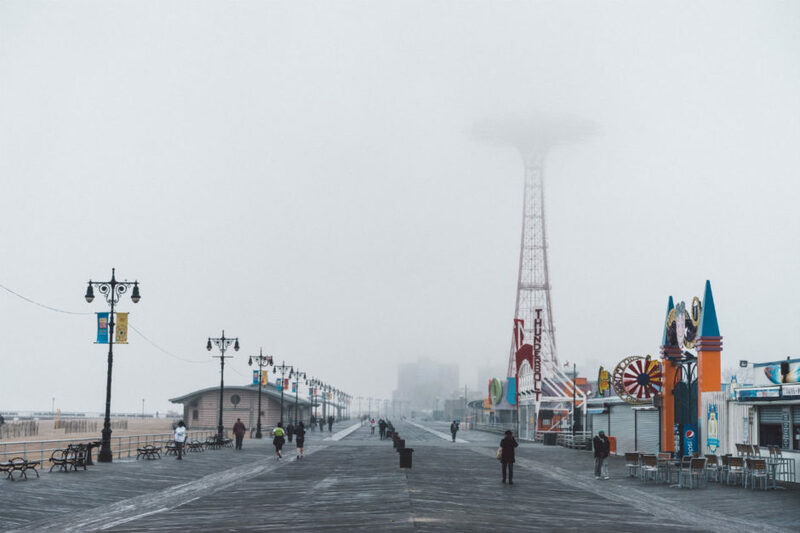 Don’t let its distance from Manhattan deter you — Coney Island is an easy subway ride away, and still has the magic that’s made it an iconic location since the first amusement park opened here in 1895. Visit early to capture an atmospheric shot without the crowds. Morning mist won’t necessarily spoil a photo — just use a slightly longer exposure time so the fog doesn’t flatten the colors in your image. South Cove Park is one of my favorite spots from which to catch the sunset or sunrise. The light here is brilliant pretty much any time of the day, so make sure you have the memory space for capturing lots of photos. As a natural frame for your shot of the Hudson River and buildings beyond, try including any nearby foliage. The setting for a thousand movie scenes, Grand Central Terminal is another beautiful Beaux-Arts building in Midtown Manhattan. The most beautiful part of the main concourse must be the roof — it’s scattered with renditions of the constellations and painted an incredibly vivid blue. Try shooting the ceiling from different angles and, to capture a sunburst in your photo, wait till the sun is low in the sky and try using a narrow aperture that’s around f/22. Brooklyn Botanic Garden, in Prospect Park, is home to the annual Cherry Blossom Festival and various specialty gardens, including my favorite: the C.V. Starr Bonsai Museum. 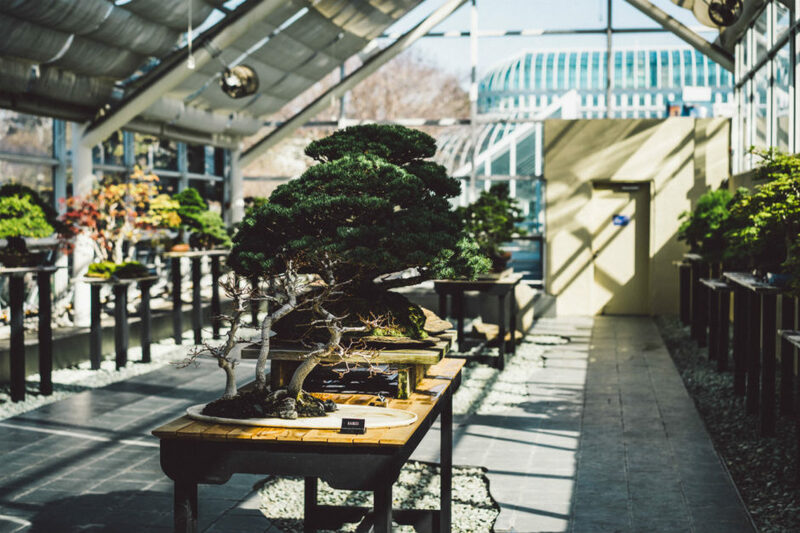 It's one of the largest public bonsai collections outside Japan, and the natural light streaming through the conservatory ensures most of the hard work is done for you; just find your frame and take your shot. This historic area where Fulton Street meets the East River has fantastic photo opportunities. 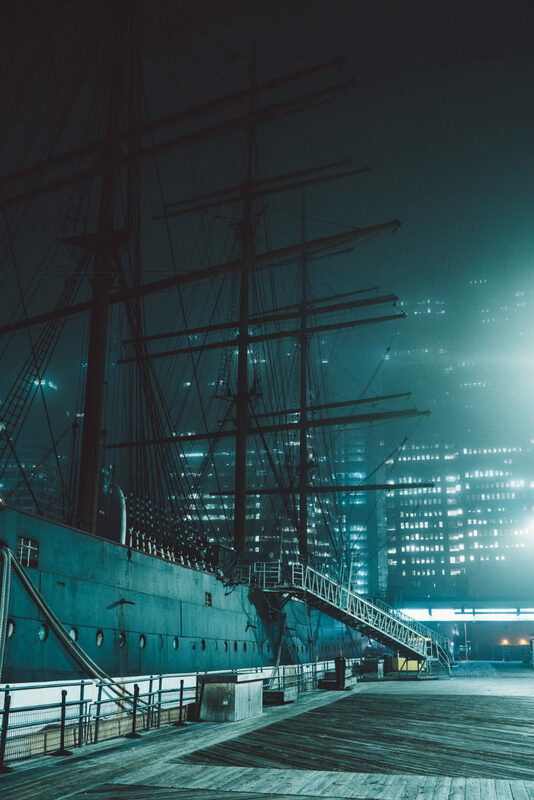 Home to some of the oldest architecture in NYC and visit the five historic vessels permanently docked in the port. Pictured is the Peking ship. For a similar effect to what you see in the photo, come at the tail end of "blue hour." This building held the "tallest in the world" title for 17 years until the Chrysler Building and 40 Wall Street took the crown in 1930. From the outside, it looks like a grand European cathedral stitched onto a giant skyscraper; for a glimpse of the interior you’ll have to reserve a tour. 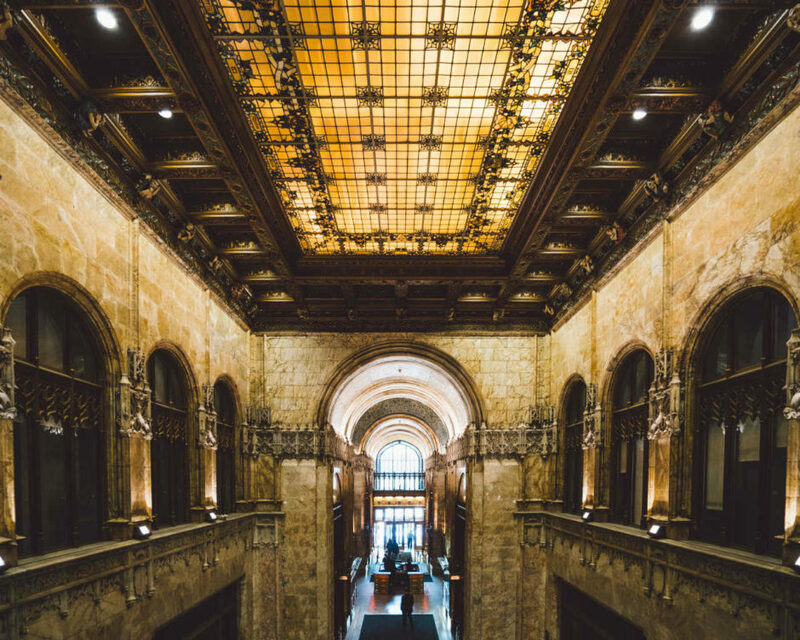 They’re about an hour long, just enough time to learn about the building’s interesting history — Frank W. Woolworth, kingpin of the five-and-dime store, actually paid for its construction in cash — and get gorgeous photos of the bronze-plated and marble interior. There’s more to public art in the Financial District than Charging Bull. 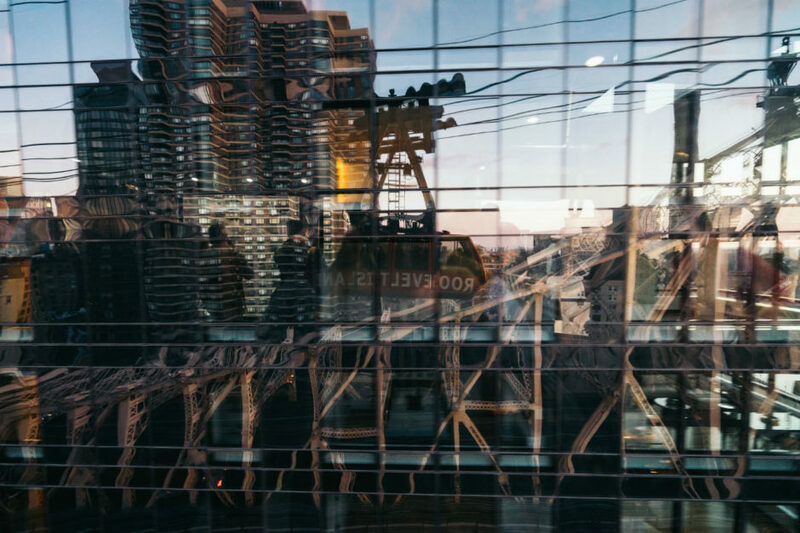 Yuyu Wang’s East West Gate, on Water Street, is typically captured in selfies, so for a different perspective tilt your camera up and capture the reflections of the surrounding buildings. This gallery is proudly produced by Matador for the IHG Travel Blog, where it was originally published. Check it out: Instagram New York City: 12 places for the best vacation photos.